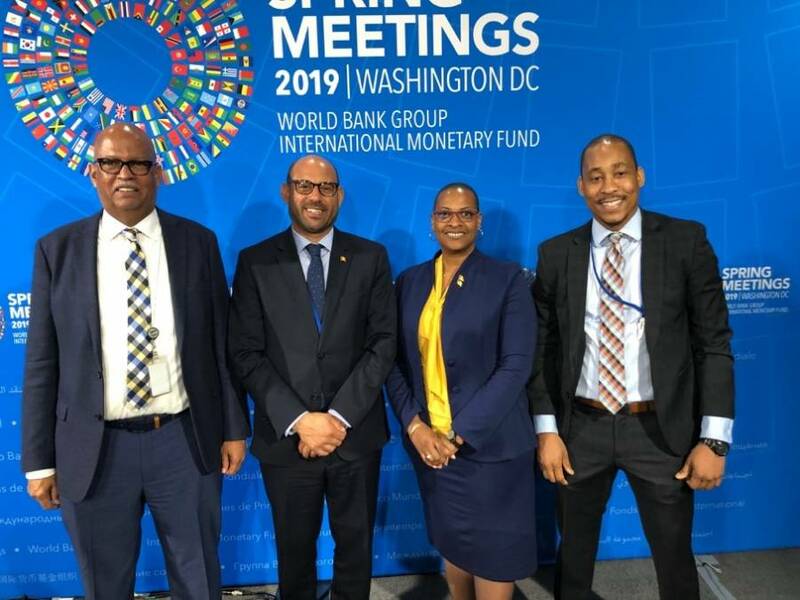 Minister for Climate Resilience, the Environment, Fisheries, Forestry, Disaster Management and Information, Honourable Simon Stiell is in Washington, DC attending the World Bank Group (WBG) and International Monetary Fund (IMF) Spring Meetings, taking place 8-14 April 2019. Over the last 3 days, Minister Stiell has had several meetings with key executives of both financial institutions. The Minister called on Louise Levonian, IMF Executive Director for Canada, Ireland and the Caribbean; World Bank Director for the Caribbean Tashnee Sayed; World Bank Executive Director for Canada, Ireland and the Caribbean Christine Hogan; and Krishna Srinivasan, IMF Deputy Director for the Western Hemisphere Department. On Wednesday, Minister Stiell participated in a dinner meeting hosted by the Ambassador of Norway, with Norway’s Minister of Development and Fiji’s Minister for Economy, Civil Service, Communications and Climate Change, on the topic Ocean Action: The role of the World Bank and the Multi-donor Trust Fund PROBLUE. The meeting included an update on operations in this field and had participation from the delegations from the Pacific Islands – leaders in the Blue Economy. On Thursday, Minister Stiell was a panellist at a seminar on Working Together Towards a Disaster Resilience Strategy where he presented Grenada’s fiscal resilience strategy model as a best practice. At the seminar, panellists from Grenada, Dominica, Jamaica and Barbados discussed key areas of concerns and opportunities for the Caribbean region including structural resilience, natural resources and the blue economy, social delivery and social safety nets, risk protection/risk mitigation, and flexible financing instruments for resilience building. 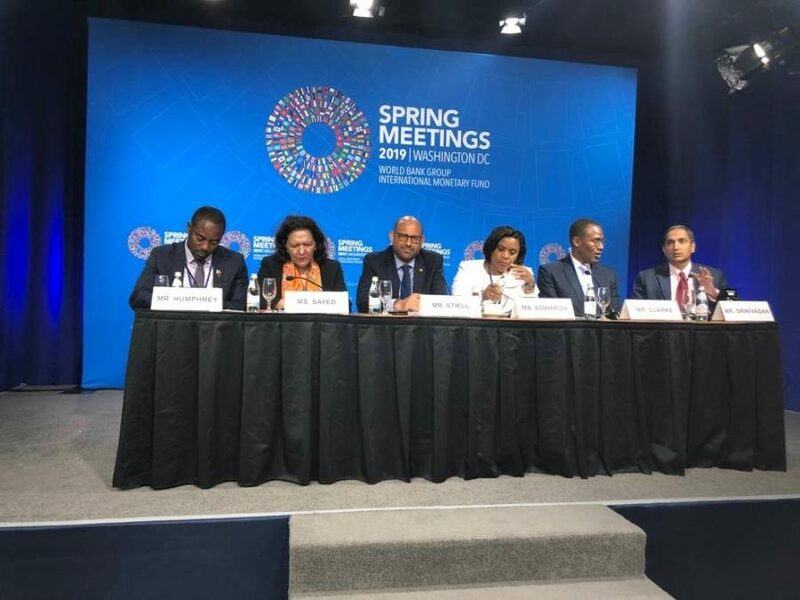 This seminar was followed closely by another on Climate Change: Financial Risks and Opportunities, where Governor of the Eastern Caribbean Central Bank, Timothy Antoine, one of the panellists, provided perspectives on the Caribbean dilemma. Minister Stiell, who also attended that seminar held discussions afterwards with the Governor on a number of issues. During the visit to Washington DC, Minister Stiell also has the opportunity to engage with two Grenadians at the IMF – former Permanent Secretary in the Ministry of Finance, Mike Sylvester who is now Advisor to the Executive Director for Canada, Ireland and the Caribbean, and Dr Arnold McIntyre, Deputy Division Chief, Caribbean Division of the Western Hemispheric Division. While the Spring Meetings are attended by approximately 2,800 delegates from member countries, 350 observer organisation representatives, 800 members of the press and approximately 550 accredited civil society members, the meetings are comprised of events open to all attendees, ministerial-level invitation-only sessions, closed bilateral meetings, and events open only to members of the press. Minister Stiell was accompanied to the meetings by Grenada’s representative in Washington DC, Ambassador Yolande Smith. The minister returns to Grenada on Saturday, 13 April.